A large proportion of MPs said the schools’ watchdog Ofsted could not be trusted to carry out the inspections. MPs believe the Government should scale back or drop “meddling and intrusive” inspections of out-of-school settings in England, a new poll has found. The ComRes poll, commissioned by The Christian Institute, found widespread scepticism of the Government’s ability to inspect out-of-school settings without threatening “legitimate and reasonable” activities. Institute Director Colin Hart said the findings made it clear that MPs are ‘widely concerned about the draconian proposals’. The Government has proposed introducing a nationwide registration scheme for any out-of-school setting providing instruction to under 19-year-olds for more than six hours in any week. Inspections would be carried out by Ofsted. But the poll showed a substantial majority of MPs feel the proposals have been too widely drawn and should be scaled back. 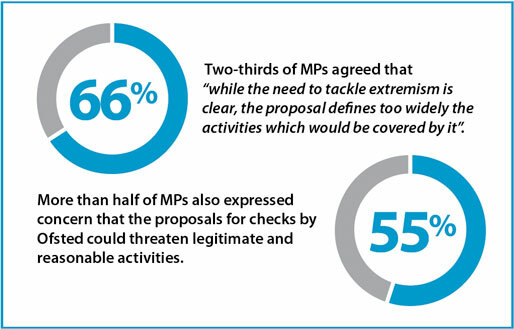 Two-thirds of MPs (66 per cent) agreed that “while the need to tackle extremism is clear, the proposal defines too widely the activities which would be covered by it”. This rose to 69 per cent among Conservative MPs. Among all MPs, just one in seven (15 per cent) disagreed. More than half (55 per cent) of MPs also expressed concern that the proposals for checks by Ofsted could threaten legitimate and reasonable activities. This figure rose amongst Conservative MPs, with almost two-thirds (62 per cent) saying they will and just one in four (25 per cent) disagreeing. And a large proportion of MPs said the schools’ watchdog could not be trusted to carry out the inspections. Asked whether they “trust Ofsted to conduct any such checks in a fair, reasonable and measured way”, 38 per cent disagreed and just 35 per cent agreed. Commenting on the figures Christian Institute Director Colin Hart said the MPs recognised that “the extension of these meddling and intrusive inspections will have a serious effect on many small community groups”. ComRes polled 150 Members of Parliament by self-completion postal questionnaires and online between 13 January and 23 February 2016. Data were weighted to be representative of all MPs.